Vending machines have gone beyond trail mix and candy for a while -- you may have noticed Apple iPod vending machines at your local airport, something I always thought was a bit odd but figured that if Apple can sell that way, then more power to them. 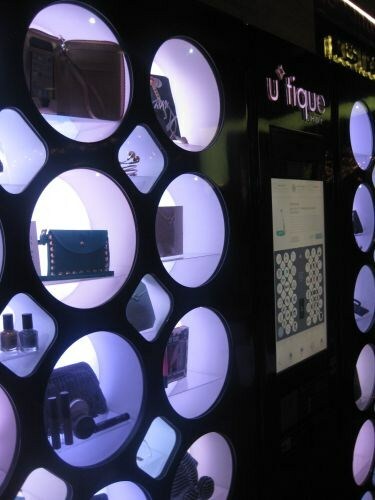 Yesterday while attending a Cosmoprof North America bus tour of the Best Beauty Retailers of Las Vegas, we beheld this sight on the casino floor of The Cosmopolitan Las Vegas: a beauty products vending machine by e-tailer U*tique Shop. Containing products from nail polish to mascara to lip gloss (plus other products for the demographic of stylish women), it sells products that cost anywhere from a few dollars to over $100. It catches the attention of passers-by with blinking lights, though tour attendees did comment they were surprised the machine didn't talk. "Want some lotion for those chapped hands?" 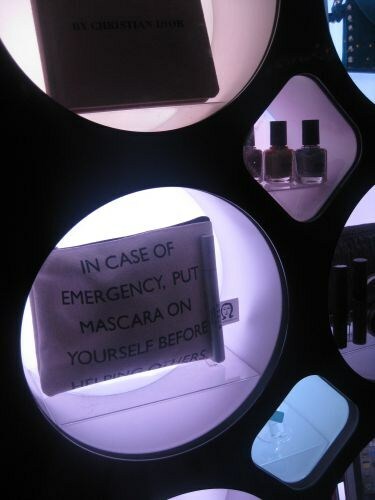 I certainly don't think the vending machine is a replacement for the personal touch in your salon's retail boutique, but it does impart a valuable lesson: If you merchandise your products in a unique way, sales will come.